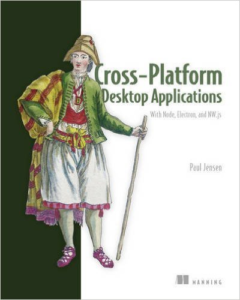 Save 37% on Cross-Platform Desktop Applications. Just enter code fccjensen into the discount code box at checkout at manning.com. NW.js’ architecture consists of several components, Node.js being one of them. The way that NW.js makes use of Node.js is to provide a way to access the computer’s file system and other resources that’d otherwise be unavailable due to web browser security. It also provides a way to use many libraries through npm. You might know that both Node.js and Blink have API methods with the same name and that work in the same way (e.g. console, setTimeout, encodeURIComponent). How are these handled? In some cases, Blink’s implementation is used, and in other cases, Node.js’ implementation is used. NW.js opts to use Blink’s implementation of console, and for setTimeout, the implementation used depends on whether the file is loaded from a Node.js module or from the desktop app. This is worth keeping in mind when you’re using those functions – although they’re consistent in their implementations of inputs and outputs, there might be a slight difference in speed of execution. Electron uses Node.js along with Chromium, but rather than combining the event loops of the two pieces of software together, it combines them through Node.js’ node bindings feature. In this way, the Chromium and Node.js components can be updated easily without the need for custom modification of the source code, nor compilation afterwards. Learn more about the book on liveBook here and in this Slideshare presentation.